Members of the Legislature came out in droves yesterday to attend a special meeting with ranking officers of the U.S. military’s Pacific forces to discuss the military’s plan to build a “hybrid” alternative airfield in the Commonwealth. The meeting on Capital Hill was the first between the military and lawmakers regarding the proposed plan. 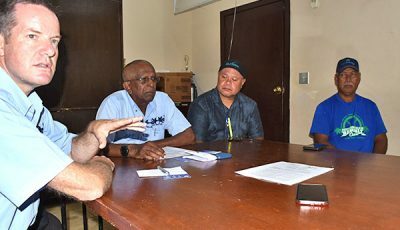 Rep. Angel Demapan (R-Saipan), chairman of the House Committee on Federal and Foreign Affairs, called for the meeting in a letter earlier sent to the military top brass. Present to face the lawmakers were Maj. Gen. Michael Dana from Pacific Command, Rear Adm. Bette Bolivar, Brig. Gen. Steven Basham from Pacific Air Forces, and Craig Whelden, executive director of Marine Forces Pacific. For Rep. Joseph Lee Pan Guerrero (R-Saipan), a military presence on an island that is very much dependent on tourism may have a negative impact on the industry. He said it might send a signal that something is “wrong,” particularly if the military presence is on Saipan. 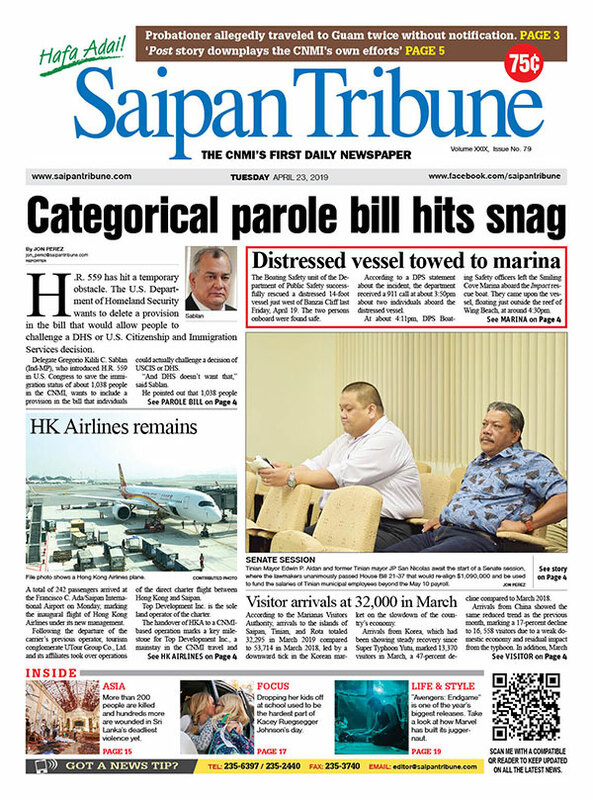 Sen. Arnold I. Palacios (R-Saipan) said noise pollution remains a major concern, citing the military planes flying in and out of the proposed divert airfield. “I am requesting the military to also listen to the needs of the community,” Palacios said. For Sen. Sixto Igisomar (R-Saipan), there are “many areas that need clarity.” He cited marine protected areas, or MPAs, that, because of military exercises, no longer exist. He also stressed that proposed military training in some areas, such as Pagan, may not bode well with locals living in these areas. “There are a lot of questions, and a lot of issues that the military needs to address clearly,” Igisomar said, adding that one of these major questions is if there really is an economic value that will result from these military installations. Rep. Felicidad Ogumoro (R-Saipan) asked if there is a letter from the U.S. government specifically asking if the military can now acquire more CNMI lands. “Where are we at? Do we have a timeline, and what happens if we say ‘no’?”Ogumoro asked. Brig. Gen. Basham said that one of the changes made in the hybrid divert plan is the scrapping of fighter jets landing on Saipan and Tinian. The changes were made to accommodate concerns on noise pollution, he said. 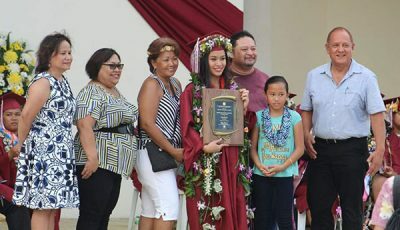 MarForPac’s Whelden added that as far as the economy is concerned, the military installation, particularly those on Tinian, will need to be manned by 95 workers. He said the military is not looking at having its personnel stay in the military base for an extended period of time, but some of the military installations still need to be maintained, thus the need for island workers. Whelden said the military is also committed to purchasing resources from local businesses as much as possible, and will tap contractors for related projects such as construction. Regarding concerns for the environment, Whelden said a draft environmental impact statement on the divert plan will be made public this Saturday, April 4, on the Federal Register. He said the draft EIS attempts to answer many of the lawmakers’ concerns. Whelden emphasized that there is no formal request yet for the military or federal government to acquire or lease lands in the CNMI, adding that the whole divert plan can be considered a “fact-finding” project. Whelden said specialist on the draft EIS will be on island next week to set another meeting. The meeting, tentatively set on April 6, will discuss questions on the environmental impact of the divert plan. Demapan said the meeting “was a good start” to find out more on the military’s divert plan. He will again preside over the meeting next week. The divert plan proposes to build an alternative landing site in the CNMI for U.S. Air Force planes in the event the Anderson Air Force Base in Guam is not available due to war or disaster.